1985 Topps is no stranger to radical printing/inking varieties. Vibrant or dull colored fronts, dark and light green backs…each card can be found in every degree along the printing spectrum if you look through enough of them. 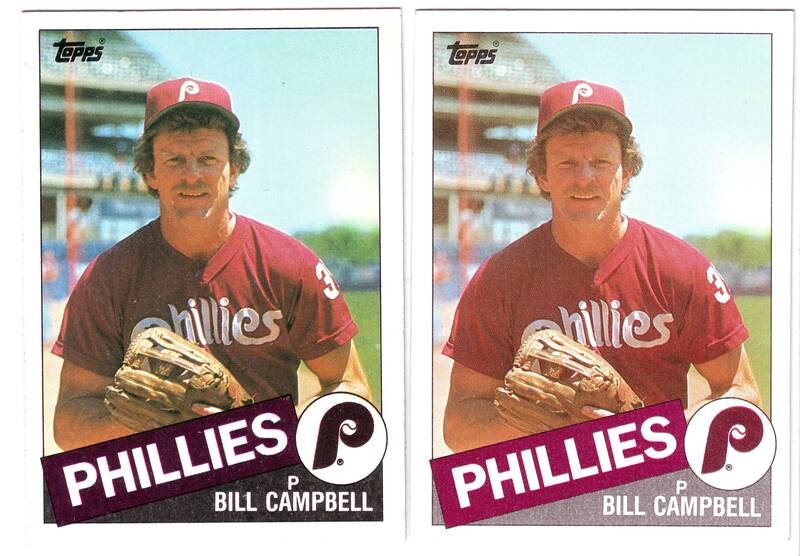 That said, one team’s cards seem to be affected by a major “darkening” and on a more-frequent basis than any other cards in the 1985 set: the Philadelphia Phillies. Now, don’t get me wrong, these qualify for the “printing flaw” label, but an argument could be made that they are actual variations in that: 1.) This type of inking extremity really only affects the Phillies cards. No other team in the 1985 Topps set has an extra shade of black inking over the team/name box/logo area. 2.) It was fixed at some point by Topps. Suggesting the possibility that it was even a design change to more accurately reflect the Phillies’ actual colors 3.) Holding the two examples in person provides a look at just how striking of a difference the “black box” versions (as they’ve come to be called in auction titles over the years) really are. Even if they don’t fit into your variation collection, they are a neat little oddity in the 1985 set, a junk-era Topps set that’s, surprisingly, lacking in major variations.